Gstaad (German pronunciation: [ˈkʃtaːd]) is a town in the German-speaking section of the Canton of Bern in southwestern Switzerland. It is part of the municipality of Saanen and is known as a major ski resort and a popular destination amongst high society and the international jet set. The winter campus of the Institute Le Rosey is located in Gstaad. Gstaad has a population of about 9,200 and is located 1,050 metres (3,445 feet) above sea level. 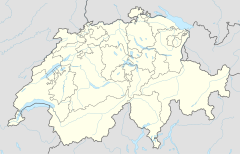 During the Middle Ages it was part of the district of Saanen (Gessenay) belonging to the Savoyard county of Gruyère. The town core developed at the fork in the trails into the Valais and Vaud. It had an inn, a warehouse for storing trade goods and oxen to help pull wagons over the alpine passes by the 13th-14th centuries. The St. Nicholas chapel was built in the town in 1402, while the murals are from the second half of the 15th century. The town was dominated by cattle farming and agriculture until the great fire of 1898. It was then rebuilt to support the growing tourism industry. The construction of the Montreux-Oberland Bernois railroad in 1905 and the construction of ski runs (the Ski Club of Saanen open in 1905 followed in 1907 by the Ski Club of Gstaad). The first ski school in Gstaad opened in 1923. In a short time, there were more than 1,000 hotel beds in the region. The residents, hoteliers, shopkeepers and tourist offices helped to promote Gstaad to international attention. They supported the construction of ice rinks, tennis courts, swimming pools, ski jumps, and ski and hiking areas. 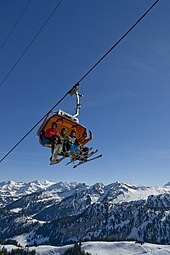 The first ski lifts at Funi opened in 1934-44 and was followed by a number of gondolas, ski, and chair lifts. The Gstaad Palace opened in 1913 as Gstaad's first luxury hotel. In 1942 the Saanen-Gstaad airfield was opened for military and civil aviation. Helicopter rides were added later and in 1980 balloon flights became available as well. During the World Wars and the Great Depression, the tourism industry suffered and many hotels closed. After World War II, many of the large hotels remained closed, but they were replaced with a number of smaller non-hotel accommodation (chalets, apartment houses, residences). Most of the modern resorts and small hotels are built out of wood and retain traditional design elements. The Gstaad Polo Club was founded in 1992. According to the Köppen Climate Classification system, Gstaad has a humid continental climate, abbreviated "Dfb" on climate maps. Gstaad, named "The Place" by Time magazine in the 1960s, is widely known for its famous part-time residents and vacationers. Famous regular visitors to Gstaad have included Madonna, Prince Charles and Princess Diana, former UN Secretary-General Kofi Annan, haute couture designer Valentino Garavani, writer William F. Buckley, Jr., and various members of the House of Cavendish. Many British bands and musicians would play at L'Atelier, a club in Gstaad, in the 1960s and 1970s; one such band was Merlin 'Q' (later Edison Lighthouse), who stayed a whole winter. Gstaad is known for its luxury hotels, among them the Grand Hotel Park, the Alpina Gstaad, the Gstaad Palace, the Grand Hotel Bellevue, the Hotel Olden, and the Arc En Ciel. Current and former residents of Gstaad include: Alinghi yachting syndicate boss Ernesto Bertarelli and actress Julie Andrews, Formula One Holdings owner Bernie Ecclestone, French actress Jeanne Moreau, French singer Johnny Hallyday, columnist Taki Theodoracopulos, actors Elizabeth Taylor, Sir Roger Moore, Jane Randolph and Peter Sellers, children's author Richard Scarry, businessmen George Soros and Steve Wynn, directors Roman Polanski and Blake Edwards, violinist Yehudi Menuhin, Prince Rainier and Grace Kelly, modern artist Balthus, Mohammad Reza Pahlavi, British jewellery designer Andrew Grima, Swiss philanthropist Philipp Braunwalder and Filip Peters. "Swiss Miss," the second-season premiere of the American animated television series Archer, takes place in Gstaad. Richard Scarry had a studio in Gstaad where he drew many of his books. Philosopher Jiddu Krishnamurti was an occasional visitor to Gstaad; he included the experiences of his 1961 visit in his diary Krishnamurti's Notebook. Some scenes of Blake Edwards' movie The Return of the Pink Panther with Peter Sellers were filmed in Gstaad. ^ a b Gstaad in German, French and Italian in the online Historical Dictionary of Switzerland. ^ Laffaye, Horace A. (2015). The Polo Encyclopedia. Jefferson, North Carolina: McFarland & Company. p. 150. ISBN 9780786495771. OCLC 931799202. ^ "Climate Norm Value Tables". Climate diagrams and normals from Swiss measuring stations. Federal Office of Meteorology and Climatology (MeteoSwiss). Archived from the original on 14 May 2013. Retrieved 31 January 2013. The weather station elevation is 1,045 meters above sea level. ^ a b "Coming Up Chic". Time. March 1, 1963. Retrieved 2007-12-30. ^ "He Knew He Was Right". March 10, 2008. Retrieved 2008-03-01. ^ "Snow Bike Festival | About Us". www.snowbikefestival.com. Retrieved 2016-08-25. ^ "International schools" (Archive). Gstaad. Retrieved on April 17, 2016. ^ "Switzerland gets only all-boys boarding school" (Archive). The Local. June 13, 2014. Retrieved on April 17, 2016. ^ "Gstaad: Just a simple Swiss village - for Liz Taylor and Julie Andrews". April 16, 1989. Archived from the original on May 16, 2011. Retrieved 2007-12-30. ^ "Celebrities in Switzerland: Bernie Ecclestone". 2007. Retrieved 2007-12-30. ^ a b "Switzerland Is Yours". 2007. Retrieved 2007-12-30. ^ "James Blunt planning Swiss move". January 17, 2007. Archived from the original on October 30, 2007. Retrieved 2007-12-30. ^ "Taki on Gstaad summers in the line of fire". 2007. Archived from the original on 2007-12-19. Retrieved 2007-12-30. 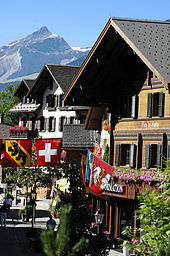 Wikivoyage has a travel guide for Gstaad. Wikimedia Commons has media related to Gstaad.